Braving a bitter north wind and snow flurries, some twenty protestors rallied outside the Spray Lake Sawmills’ open house in Blairmore, Alberta on Thursday, May 10. The Castle area, southwest of Pincher Creek, Alberta, was declared a Special Place in 1998, but remains the only one of 81 Special Places that has not yet received its final protective status. Individuals, groups, and business owners worked for over two years to try to prevent the logging. This culminated in a three-week protest in January at the site where logging was set to begin. Several protestors were arrested and/or banned from accessing public land in the province. (Proceedings have since been dropped.) Logging started after a Court Order compelled the protestors to leave. Once the logging started, and having little other choice, a group of individuals plus the Castle-Crown Wilderness Coalition initiated a Judicial Review of the logging license, and the logging itself, in the Court of Queen’s Bench in Calgary. At court date has not yet been set. 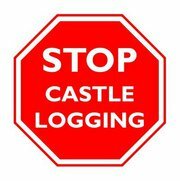 You are currently browsing the Stop Castle Logging blog archives for May, 2012.